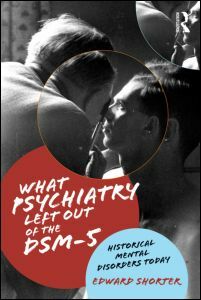 Historically-Based Mental Disorders and the DSM: What Psychiatry Left Out covers the diagnoses that the Diagnostic and Statistical Manual of Mental Disorders (DSM) failed to include, along with diagnoses that should not have been included, but were. Psychiatry as a field is over two centuries old and over that time has gathered great wisdom about mental illnesses. Today, much of that knowledge has been ignored and we have diagnoses such as “schizophrenia” and “bipolar disorder” that do not correspond to the diseases found in nature; we have also left out disease labels that on a historical basis may be real. Edward Shorter proposes a history-driven alternative to the DSM. To access the author’s interview on H-Madness, click here.